This blog post is coming from a place of anger, of sadness and despair. 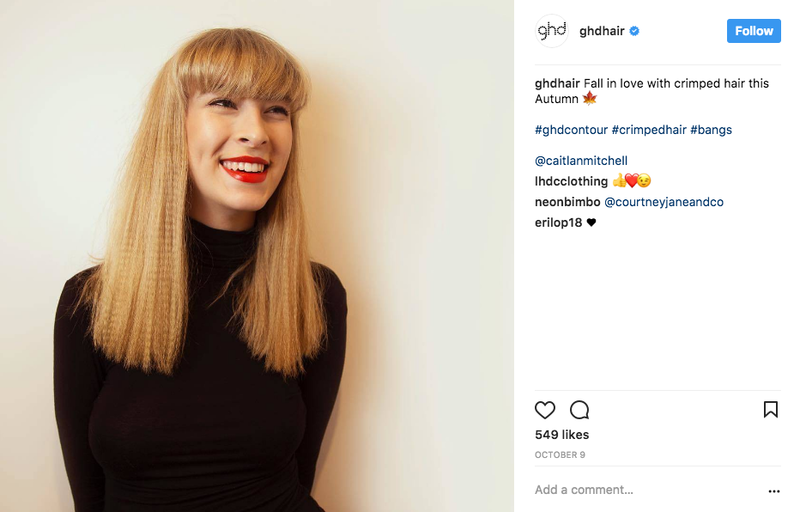 It is a response to ghd's new heat tool the "Hair Contour" and the subsequent marketing that has accompanied the product. "Contouring is the latest phenomena in beauty and ghd has taken this method into hair styling – a new way of crimping at the roots for low commitment hidden volume and personalised looks to flatter face shapes." When I stumbled upon this latest trend, I was stopped in my tracks. I couldn't believe what I had seen, or understand why it was featured on "arguably the most influential haircare brand on the planet" 's Twitter and Instagram feeds. I was sick of indirect tweeting about brands in order to get something off my chest. 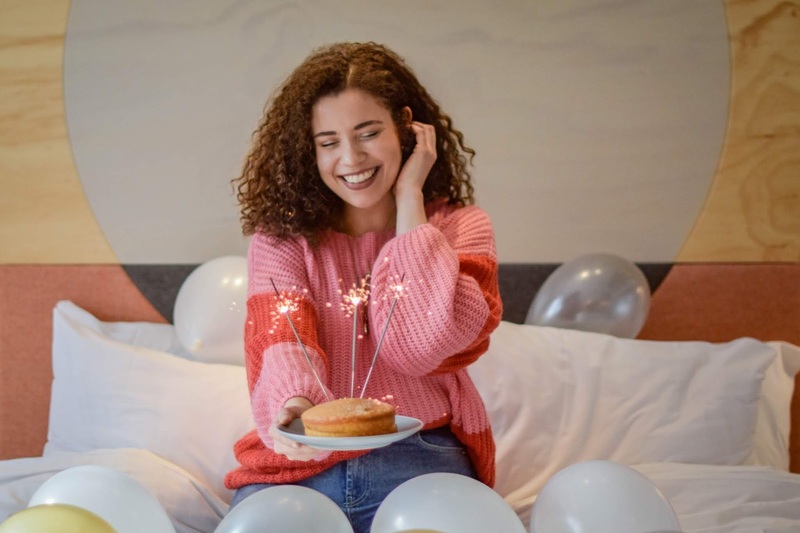 I was sick of not naming names in my blog posts in fear I would tarnish my own reputation and relationships with brands. 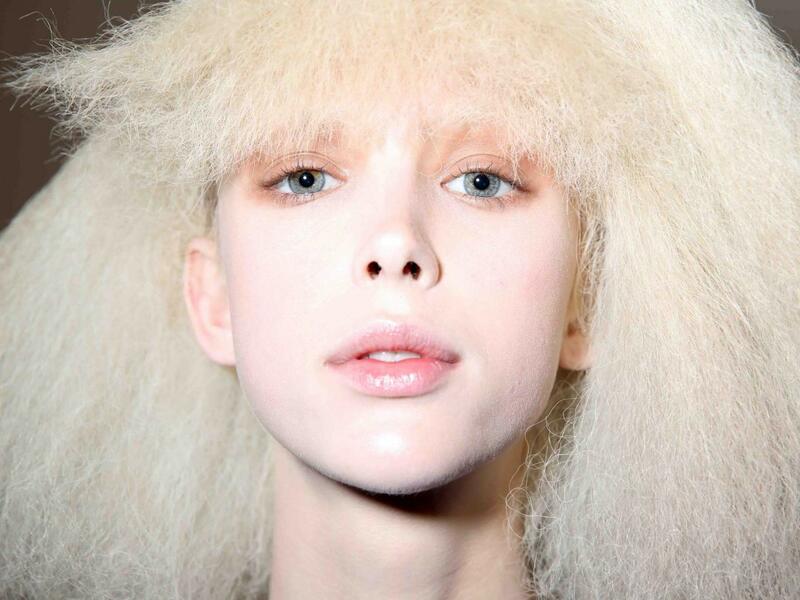 A look that’s attempted to break into the mainstream pretty much every decade since – think Britney and Christina Aguilera circa 2000 – here we are, in 2017, and crimped hair is officially back in vogue. The ghd website describes the "Hair Contour" tool as their answer to 80's style. "This season we are big on texture, with 80s-inspired looks taking centre stage on the catwalk. In response, we proudly present the new ghd contour™ professional crimper. " This season "texture" is in! Woo! But unfortunately for me, it is "texture on Caucasian people" that's "in". According to ghd's Instagram page, ghd's website, ghd's marketing choices and ghd's PR choices, ghd is a brand exclusively for white people, even when the hair trends they are portraying as "fashionable", exclusively and naturally belong to people of colour. "a new way of crimping at the roots"
This was the featured image for the previously quoted Independent Newspaper article. Is this Marc Jacobs all over again? Remember New York Fashion Week 2016, when Marc Jacobs was accused of cultural appropriation? Jacobs sent models - including Gigi Hadid, Bella Hadid and Kendall Jenner - down the runway in multicoloured dreadlocks. “I don’t really think about that,” he said. “I take inspiration from every culture. He went on to insist that Rastafarian culture hadn’t been an influence and that the look was inspired by Lana Wachowski, who recently starred in one of Marc Jacobs’ campaigns, as well as 80s icons Boy George and Marilyn. Is it too radical to dare say that this is the modern, hair version of black-face? I believe there are two issues at large here. Number one being the identity theft/appropriation of afro hair and texture without credit or inclusion of the afro hair community by ghd. 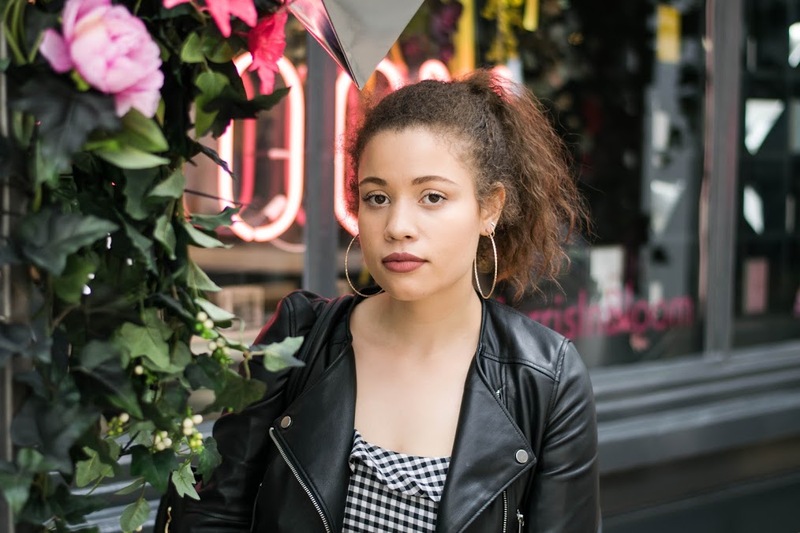 This includes the idea that a hair type that naturally occurs in a large percentage of people, could be seen as "trending" or "fashionable" but only on someone of a contrasting skin colour. 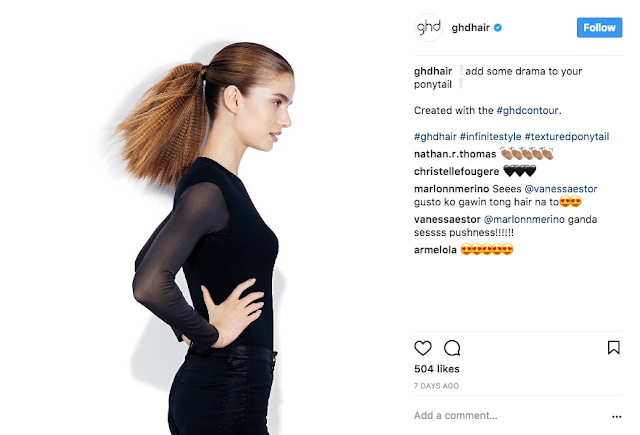 Number two, is the lack of representation of POC within ghd's press imagery, social media imagery and marketing. I indirectly mentioned ghd within a previous blog post when discussing the lack of diversity within the blogging industry. 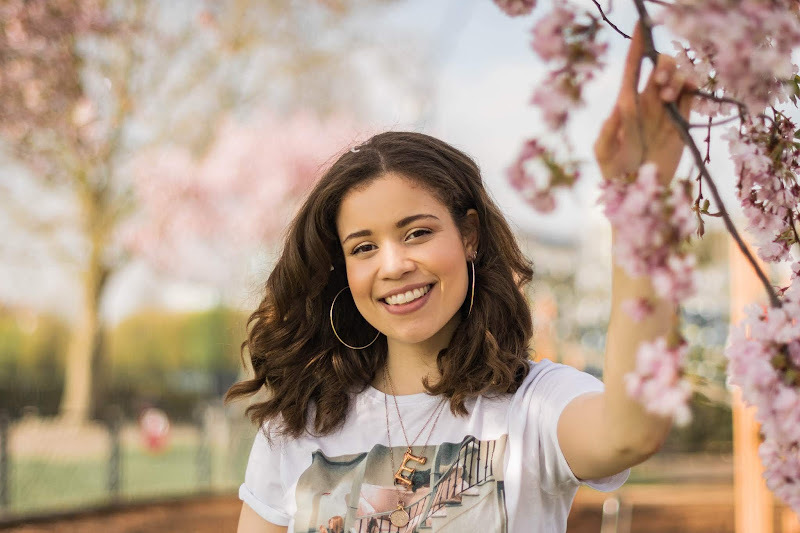 Ghd do not make enough effort to represent bloggers of colour within their press events and campaigns. I find that the outcome of this exclusion just becomes highly ironic and even laughable - ghd wish to mimic my naturally- occurring curl pattern and texture whilst totally excluding me from their brand. How many times are curly-haired and afro-haired men, and specifically women, sold the idea by our peers and by hair companies that we need "frizz control" and to "tame those curls"? Our natural curl patterns and textures, have thus far, been a way to brandish our appearance as messy and undesirable. According to the hundreds of TV and magazine ads I grew up with in the UK, it's swishy, shiny, Pantene hair that is seen as attractive and acceptable. 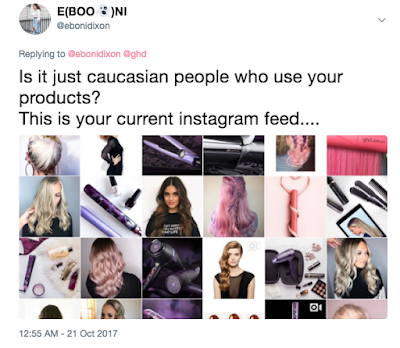 Our hair texture has never been celebrated the way that ghd is now celebrating "hair texture" on Caucasian models. I would love to know your thoughts on this subject. This topic is very fresh, and after doing my own research, I have failed to come across any similar articles. I hope that with this post, I can start a conversation that may help brands to do better in future. 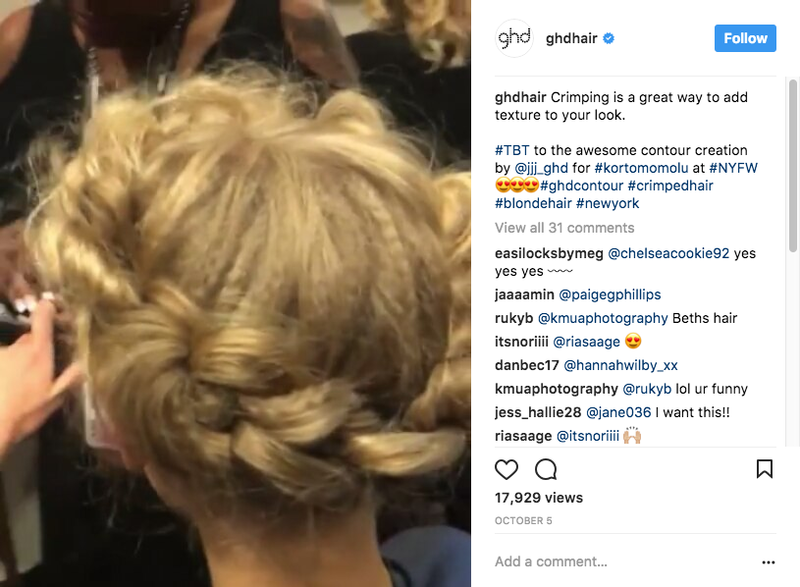 We share tags from our followers and we try to be representative across our social channels, including ghdhair and ghdhairpro on Instagram"
Since these tweets, their Instagram feed has become more diverse with an asian and black model now being featured.